Previous post: How I Met My Dinner: You Have to Czech It Out! Details on how to win a copy of Magic Breaks at the end of this review, as well as a link to purchase the book where a portion goes to help support KRL. 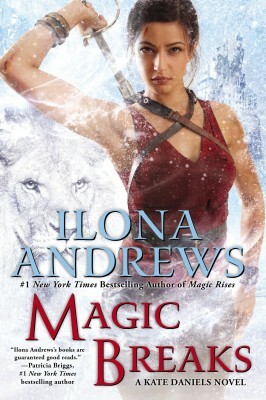 I have been looking forward to Magic Breaks, the new book by Ilona Andrews; they just keep getting better and better. This whole series has been building to this point. Kate has been running from her father her whole life. He tried to kill her before she was born. Her mother ran away from her father to keep her safe and sacrificed her life to protect Kate. Basically her father murdered her mother, trying to kill Kate. Kate has been taught to keep the secret of who she is and who her true father was her whole life. The man who raised her, Vorlon, brought her up to do one thing, to kill Roland, her father. He spent years trying to turn her into a killer, to hide her blood, which would give her away and never get close to anyone. But Kate has broken the rules. She has friends, is mated to Curran, and has adopted Julie. There are friends and family that she cares about, and several of them know who her father is. But Kate and Curran have grown as a couple and they have done some planning on how they want their life to go forward. But as with most plans, things go awry. So this book is where she finally gets to meet, dear old dad. So what will win out–her training to kill him or her nature to protect? There are a lot of dark scenes and ratcheting tension. The humor makes lovely little grace notes throughout the book. The characters keep growing and it’s what makes the books so compelling. One of the main problems with gaining friends is the need to keep the other characters developing as well as the main characters. It is fun to watch how Derick, Andrea and Ascano keep growing and changing, Kate interacting with them and how they interact with each other. There are still a couple of major problems looming. I’m wondering if they will reveal what is really going on with a couple of characters and what their motivation really is. There are those that have done horrible things in the past. To enter to win a copy of Magic Breaks, simply email KRL at krlcontests@gmail[dot]com by replacing the [dot] with a period, and with the subject line “Breaks,” or comment on this article. A winner will be chosen August 16, 2014. U.S. residents only. Check out more fantasy/horror book and TV reviews in our Fantasy and Fangs section. Mary Anne Barker works at the Reedley Library. She loves books, TV and movies. I am curious about the problems you are perceiving… =) The problems of trying to keep it spoiler-free. Feel free to email me should you have the time. =) I’ve read it four times already, and I love the series! thank you for the giveaway! I love this series!